Benetti announces the delivery of the motor yacht Ocean Drive. 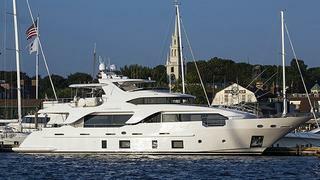 It also marks the debut of the Delfino 93 series in US waters. Ocean Drive, previously known as hull number BD003, is the second Delfino 93 motor yacht delivered by Benetti this year, following the launch of Azul in April. Ocean Drive was also launched this spring, and she's part of this successful series now comprising four units delivered, and four others under construction. As a reminder, the Delfino 93 is a 28.5m ‘pocket superyacht’ which made her debut at the Festival de la Plaisance at Cannes in 2010. Built in composite to a perfectly conceived design by Stefano Righini, the yacht has an interior by Carlo Galeazzi and accommodates 10 guests in full comfort. Twin 747kW MTU engines give the Delfino 93 a top speed of 14 knots and a range of 1,500 nautical miles at 12 knots. Ocean Drive is now delivered to her US owners and is cruising off The Hamptons.